where the state vector x represents the inductor currents and capacitor voltages, the input vector u represents the voltage and current sources, and the output vector y represents the voltage and current measurements of the model. Nonlinear elements, such as the switch devices, motors and machines, are simulated by current sources driven by the voltages across the nonlinear element terminals. The nonlinear elements produces additional current source inputs to the u vector, and additional voltage measurements outputs to the y vector. The Simulink® blocks of the model, as well as internal Simulink models of the Simscape Electrical Specialized Power Systems nonlinear elements are not represented in the state-space matrices. The A, B, C, D matrices are computed for the particular circuit topology where all the switch devices, if any, are considered to be open status (that is, with infinite impedance). power_analyze also computes the Aswitch, Bswitch, Cswitch, and Dswitch matrices for the circuit topology that take into account the initial state (open/closed) of the Breaker and Ideal Switch blocks present in the model. The initial state of power electronic devices (Diodes, Thyristors, and so on) is considered to be open, unless a nonzero initial current value is specified in the mask of the device when Lon parameter is different from zero. For a circuit that contains no switches, the Aswitch, Bswitch, Cswitch, and Dswitch matrices have exactly the same values as the A, B, C, D matrices. In Simscape Electrical Specialized Power Systems software, each state variable name begins with a prefix Uc_ for capacitor voltages or Il_ for inductor currents, followed by the name of the block in which the element (C or L) is found. A character vector is added to this prefix for blocks containing more than one inductance or capacitor. For example, the Linear Transformer block is represented with four state variables, one for each of the three leakage inductances, defined with the prefixes Il_winding_x:, where x is the winding number of the transformer, and one state for the magnetization inductance defined with the prefix Il_Lm:. Each input state variable name begins with a prefix U_ for voltage sources or I_ for current sources, followed by the name of the source block. Text can be added to the prefix for blocks containing more than one source. For example, the Synchronous Machine block produces two current inputs with prefixes I_A: and I_B: (phase A and phase B machine currents). Each output state variable name begins with a prefix U_ for voltage outputs or I_ for current outputs, followed by the name of the block that produces the output. Text can be added to the prefix for blocks containing more than one output. For example, the Synchronous Machine block produces two voltage outputs with prefixes U_AB: and U_BC: (two machine phase-to-phase voltages). Source current flowing in the arrow direction is positive. Positive source voltage is indicated by a + sign on the icon. The sign conventions used for voltages and currents of state variables and measurement outputs are described in Measuring Voltages and Currents. See also Sign Conventions for Voltages and Currents for current directions and voltage polarities. sps = power_analyze('sys','structure') creates a structure array sps with fields and values describing the model sys. The fields of the structure array are defined in the following order. nstates-by-nfreq steady-state values of states. A set of values is computed for every frequency specified in the frequencies vector. ninput-by-nfreq steady-state values of inputs. A set of values is computed for every frequency specified in the frequencies vector. noutput-by-nfreq steady-state values of outputs. A set of values is computed for every frequency specified in the frequencies vector. char array of dependent state variable names. The dependent states are not included in the state-space equations. Discrete state-space A matrix. Returns an empty value when the Powergui is in continuous or in phasor mode. Discrete state-space B matrix. Returns an empty value when the Powergui is in continuous or in phasor mode. Discrete state-space C matrix. Returns an empty value when the Powergui is in continuous or in phasor mode. Discrete state-space D matrix. Returns an empty value when the Powergui is in continuous or in phasor mode. Vector of discrete initial conditions. Returns an empty value when the Powergui is in continuous or in phasor mode. nstates is the number of states. ninput is the number of inputs. noutput is the number of outputs. nfreq is the number of input source frequencies. power_analyze('sys') returns the state-space calculations in separate variables. sps = power_analyze('sys','sort') returns a structure array sps with the following fields related to the interconnection of Simscape Electrical Specialized Power Systems blocks in a model. The fields are defined in the following order. sps = power_analyze('sys','ss') creates a continuous state-space model of the model sys with matrices A, B, C, D. You must have Control System Toolbox™ software installed for this option. The output is a state-space object. power_analyze('sys','net') generates a netlist stored in a file, sys.net. The file contains the node numbers automatically generated by power_analyze, as well as parameter values of all linear elements. See the formats described in the power_statespace reference page. SW = power_analyze('sys','getSwitchStatus') returns a structure array with switch names and their initial status. You can use the SW structure to specify switch statuses for a particular circuit topology and to compute the corresponding state-space matrices using the command sps = power_analyze('sys','setSwitchStatus',SW). The SW structure contains the following fields. SW = power_analyze('sys','getSwitchStatus') to obtain the SW structure array. 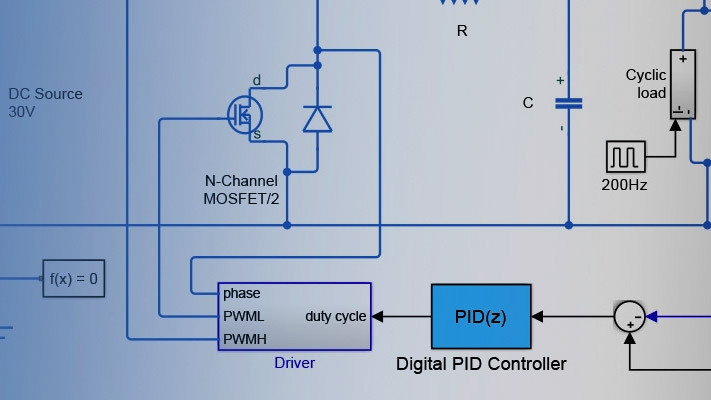 Obtain the state-space matrices and steady-state voltages and currents for the power_netsim2 circuit. returns the state-space model in the sps structure variable. The inductor current of the 51-ohm, 12-mH block and the capacitor voltage of the 120-ohm, 16-µF block are the two state variables in this circuit. The Breaker block is a nonlinear element that is represented by a current source (the first input) driven by the voltage across its terminals (the first output).